Second Annual World Dog Surfing Championships. Photography Courtesy Abbie Surfs. 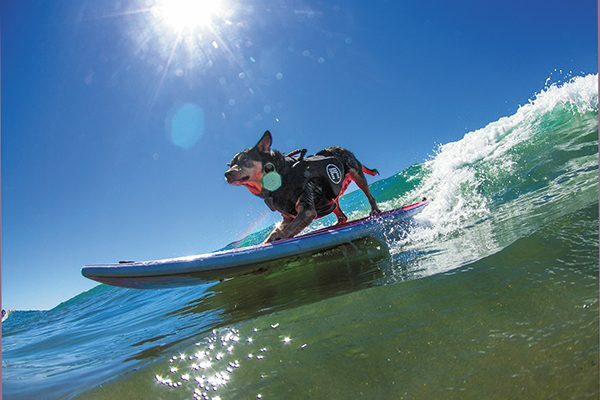 If you’re in California, surfs up with the World Dog Surfing Championships. Grab your dog and his surfboard (or just your camera for those of us who don’t surf), and get over to Linda Mar Beach, Pacifica, California, for the Second Annual World Dog Surfing Championships — a dog-charity sporting event. Both top dog surfers and amateur pups are invited. Find out which dog makes waves winning the Golden Surfie. Other activities include: a dog beach fashion contest, dog adoptions, partner tents and more. Get all the details at surfdogseries.com. What’s summer without an outdoor pet festival? If you’ve never been to beautiful Victoria, BC, Canada, then this is the time to go. Victoria is just one stop in the Pet-A-Palooza Tour 2017 (next up: Yaletown, Vancouver, August 27th). There will be treats, toys, accessories and loads of swag. The event benefits Just Love Animals Society. More at petapaloozawest.com. Watch Clear the Shelters, a national pet adoption event, on NBC and Telemundo stations or find out how to participate at a shelter near you. It’s the campaign’s second year of joining with hundreds of animal shelters to offer low-cost or waived pet adoption fees to help families adopt their next furry family member. Find more information at cleartheshelters.com. This is the last day for creative canine-loving writers to enter to win the PAWlitzer Prize for Best Dogged LITTERature presented by Carmel Dog Tales. They are looking for the adventure, romance, comedy or tearjerker tale about you and your BFF (best furry friend). There will be winners in two non-fiction categories: Drama and Humor. The prize will be awarded in Carmel, California on October 14, 2017. If poetry is more your style, enter the PAWetry Slam by submitting a YouTube video. All net proceeds will benefit the SPCA for Monterey County and the Birchbark Foundation. For more information, go to carmeldogtales.com. The post Dug Up at Dogster: August Dog Events appeared first on Dogster.